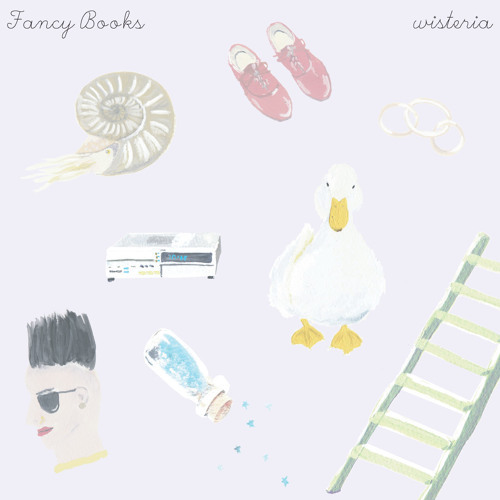 Fancy Books - Wisteria EP 2012/7/25 on sale http://deadfunnyrecords.com/portfolio/fancy-books-wisteria-ep/ 埼玉の男女デュオFancy BooksによるデビューEP『Wisteria』は、まさに「Au Revoir Simoneミーツ Memory Tapes」のようなファンシーなサウンドが魅力的である。トラック2「Sister Carry Stars」が海外ブログNo Pain In Popで紹介されると、コアなインディー・ファンから絶賛され様々な海外レーベルより注目を浴びることとなる。 そして遂に、そんな彼らのEPがここ日本で世界初となるリリース。USインディー好き必聴のサウンドは最近 のCUZ ME PAINの作品とも何処か共鳴する部分が感じられる。ポスト・チルウェイブと形容できる新鮮で何処か懐かしさを感じさせる素敵な作品が完成した。 Fancy Books is a man and a woman duo based at Saitama prefecture in the greater Tokyo area. Their fascinating sounds are expressed as Au Revoir Simone meets Memory Tapes. After Sister Carry Stars from their debut EP Wisteria was reviewed on music weblog No Pain In Pop in a good way, they got an attention in music scene, Indie music listeners and music labels outside Japan, then. Synchronized with post chill wave bands and products from CUZ ME PAIN, it reminds us of old fashioned but still new music. This debut EP is their first release and we start to want their next one as you listen to this fancy Fancy Books EP.